I read a story about this poor woman who’d suffered severe damage to her jaw and health because of dental implants by a doctor called Dr. Mansueto. Is there a way to protect yourself from that type of issue? I know the case you’re referring to. First, I’ll say there were quite of few red flags in connection with this particular case. Though, a patient is never to blame in those cases. It’s quite natural to trust your caregiver. Professionals won’t meet patients at their home. They’d have you come into an office setting. In this case, he wasn’t even a dentist. He’d lost his license some time ago. You should be aware there are websites in which you can check whether or not someone is currently licensed. You can also find out if they’ve had any actions taken against them. He also convinced patients to go over the border to get their surgical procedure done. I can only guess he convinced them to go by telling them it was to save expensive American fees. Reputable dentists discourage what is known as “dental tourism”. They don’t do that in order to keep patients, but rather to protect them. For instance, Mexico has no regulations for things like sterilization of equipment. It’s completely at the discretion of the dentist. And what recourse do you have if you develop an infection from non-sterilized equipment? Absolutely none. 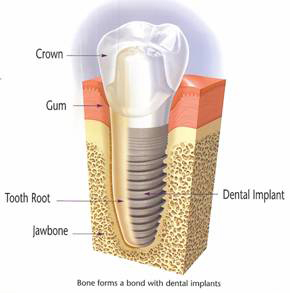 The most important decision you make is in choosing the dentist to do your dental implants. You want to make sure the dentist has taken extensive training in implants post dental school. It’s also very helpful if you find a dentist experienced in the surgical part of the procedure and not just the restoration. A lot of miscommunication happens when you have two separate professionals working on your implant case. But, if your dentist can do the surgery as well, you reduce that risk. Another thing to do is check their reviews. Have previous patients had a good experience with the dentist? Was he pleasant to work with? It never hurts to ask to see samples of their work. It won’t be that much fun having a newly restored tooth if the dentist is terrible at the cosmetic side of things. You want to know that he can make a porcelain crown which looks natural and blends in perfectly with your other teeth. Whenever you have dental work done where you’ll be getting some type of restoration, it’s a good time to think about whether or not you’ll want teeth whitening. The restoration’s color is permanent once it’s finished. Teeth whitening only works on natural tooth structure. If you’ll want a whiter smile, do it before you have the implant crown made. That way it can be made to match your more youthful looking smile. This blog is brought to you by Libertyville Cosmetic Dentist Dr. David Potts.